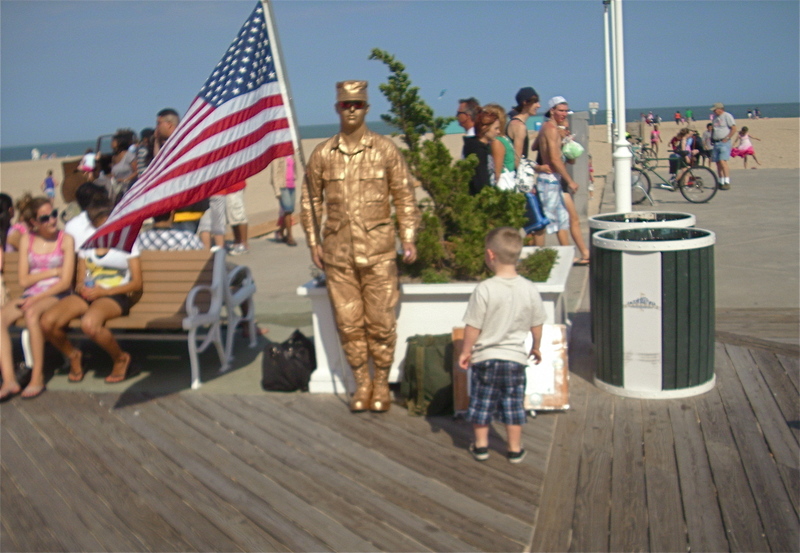 SOLDIER AT ATTENTION ON THE BOARDWALK AT OCEAN CITY, MD, MEMORIAL DAY, 2010. A CLOSER VIEW OF THE SOLDIER. HE IS A REAL LIVE MAN, STANDING IN THE SUN, WITH SKIN AND UNIFORM PAINTED GOLD. My father’s name is Bernard John Hayden, Sr. He was drafted and went for the Army physical. Hundreds of young men lined up, buck naked, in an armory, and went from doctor to doctor around the floor. One doc made sure their heart was beating, another made sure they could see, and so on, like an assembly line. The nation was on wartime footing, and government in those days was efficient. Last stop on the assembly line was the doctor who made the final decisions. He looked at the reports from the other docs, and looked my father up and down. It must have been painfully obvious that this young man with the bum arm was not promising soldier material. The head doctor said to my father: “So what’ll it be? In or out?” He was letting the draftee make the decision. Everyone was going into the Army, and my father didn’t want to be exempted from service.The one-word answer was “In,” and just that fast the choice was made. 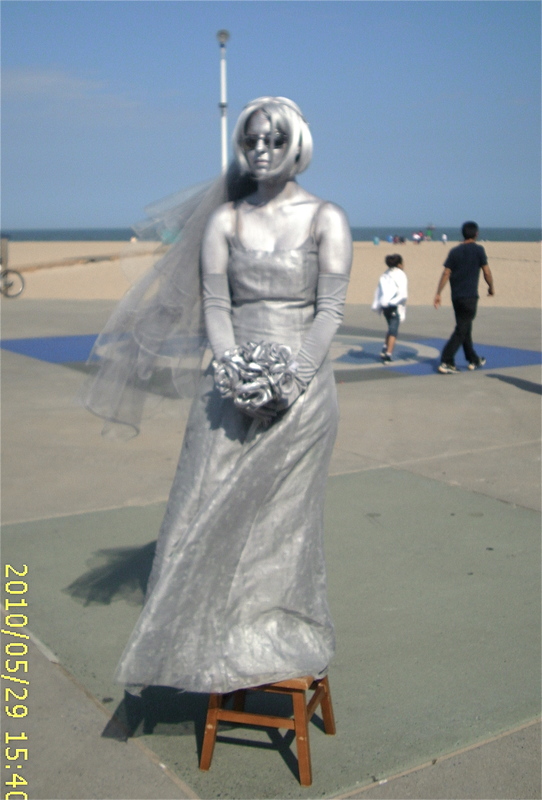 I CALL THIS LADY IN SILVER “MS. LIBERTY.” SHE IS STANDING ON THE BOARDWALK, SOMETIMES GRACIOUSLY GIVING HER HAND TO PASSERS-BY. At Holy Savior Church Saturday afternoon, the priest dispensed with his normal homily, but spoke for a few minutes about Memorial Day. We would not be free this weekend, the priest said, except for God and America’s veterans. At the end of Mass, the priest asked all veterans present to stand and be recognized. I have to report that fewer than 20 percent of the congregation stood, and they were mostly older men and women. Times have changed, and in the America of 2010, military service is no longer a universal duty. I don’t know if that is a step forward or a step back, if the goal is peace. So many questions, blowin’ in the wind . . . This entry was posted in History and tagged America, Greatest Generation, Memorial Day, Photos, Veterans, World War II by Editor (Retired). Bookmark the permalink. What a wonderful tribute to your father and our soldiers. You know, I raised my son in the ’80’s while a single mother. I remember being afraid for him to go into the military. Someone told me an only son to a single/widowed mother could never be drafted and I was glad to hear it. I believed peace meant no war, but now I realize it isn’t this simple and isn’t actually the truth. I don’t know what I had in my mind about world peace or freedom and honestly, I still don’t. I guess that’s why I don’t talk about politics much, except in my home with only the most trusted friends. The thing I understand least about our country is greed and turning a blind eye. At least I know what I don’t understand. I love the statues. Ms. Liberty is beautiful. Thank you, Michelle! BTW, the statues surprised me. They are standing stock still, so I thought they were statues. But they move a hand to acknowledge an onlooker, and I realized they are live people, completely painted gold and silver (standing in the hot sun). I just finished re-reading “Winds of War,” Herman Wouk’s masterpiece of historical-history covering the years 1938 to 1941, when Hitler took most of Europe and attacked England and Russia, and the U.S. hesitated. I think my father was drafted in 1942. After reading the book, I hardly know what to think about human governments and leaders, or war and peace. I’m more consternated than ever. Wow, I can’t believe those are real people, even though I surely thought they looked real, esp., Ms. Liberty! In fact, I looked closely, and thought wow, somebody did an amazing job. I’m embarrassed. A side note: I painted my body gold for a Halloween party I gave for my son and his friends one year. My best friend was African American, who was painted white. Many of the poor children left as we looked so unreal, they were scared when we opened the door to greet them. When I saw Ms. Liberty, I thought of that party and wondered, but the flowers is what made me decide she was a statue. I haven’t read the book you speak of. I remain bewildered by what I know and what I don’t understand and join you in your consternation. Oops, I meant to say that “Winds of War” is fictionalized history, but I believe the author followed true history closely. It’s an awesome book, but 800+ pages. Many interesting characters, many exciting historical events, a well-told story. That must have been an interesting birthday party! 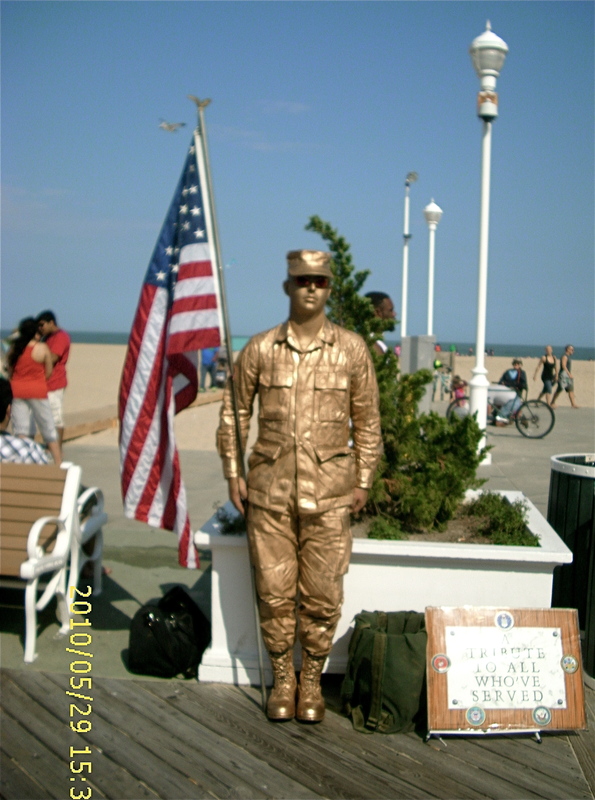 The soldier in gold and lady in silver are two of the many talented people who pay $1 a day for a license to be performance artists on the boardwalk in Ocean City, MD. They put out a glass or a bucket for tips, and I’m sure they get their $1 back many times over. The book sounds very interesting. 800 pages may be a good thing. A year ago I enjoyed reading two books, “A Kite Runner” and “A Thousand Splendid Suns.” I guess these would be considered fictionalized history. Those books captured all of my attention so I read them quickly. I would like to re-read them too. About the party, it was Halloween. The kids who were brave enough to enter the door eventually were scared by my friend’s younger sister who used to keep my son for me. She was quite the storyteller and only one child made it ’til the end. All the rest had to call their parents to come get them early. I really didn’t mean to scare them, but I was young too and I admit, much fun was had.